Highland Community School is committed to educating for sustainability. Research shows that in order to develop a strong sense of responsibility for the natural environment, we must regularly connect with a piece of land under the guidance of a caring mentor who displays concern for the environment. To create that reality for Highland students, Highland launched the Natural Grounds Redevelopment Project (Natural Grounds). Natural Grounds is a plan to transform our 2.5 acre school playground into an green laboratory for students with a comprehensive education component. We aspire to develop a robust environmental education program including an outdoor educational green landscape, stormwater management system, water conservation, urban sustainable food production & nutrition, and renewable energy. From bioswales to hoop houses to natural playground equipment, we are creating a space where children can connect with the environment on a daily basis. Economic: The problems that the next generation will be challenged to solve will require Science, Technology, Engineering & Math (STEM) yet we struggle as a country with literacy in these subjects. Our environmental education program brings STEM education to life and provides young people with the necessary academic skills and the environmental awareness to prepare for leadership roles in the STEM field in the future. Social: The evidence is clear—spending time outdoors is good for children’s minds, bodies and souls. Green spaces on the school grounds connects students to the natural environment on a daily basis. Environment: We believe that this project will have a ripple effect, inspiring children to take care of the environment that sustains us. The mission of the visual art program at Highland Community School is to develop the child’s imagination, nurture skills, and teach concepts for self-expression. Highland’s visual arts program is a sequential program which includes the basic elements and principles of design, art appreciation, visual awareness, and is fundamental to a child’s intellectual growth and self-expression. We synthesize traditional elementary art education with a child’s Montessori education. 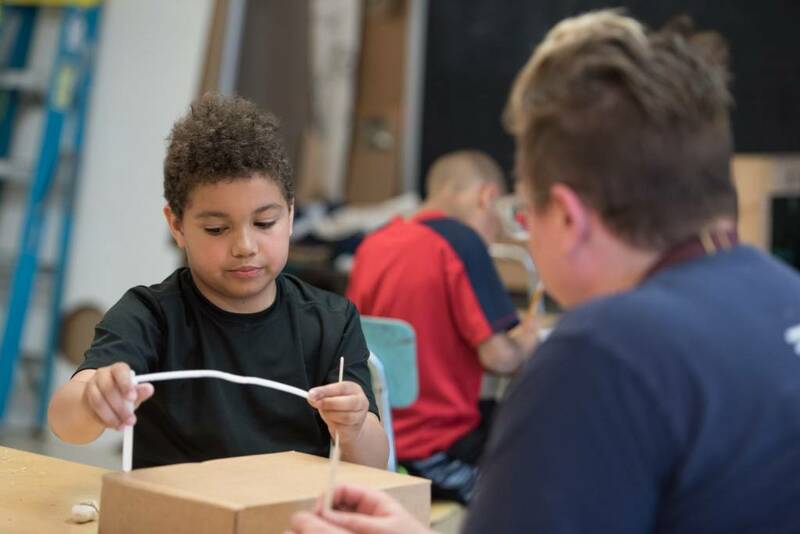 The curriculum is designed to complement the work they do in the classroom, wherein the fundamentals of art are woven into lessons that complement a child’s classroom work. The Highland Community Players is the collective name for Highland Community School’s performing arts groups. The mission of the Players is to produce raw and original works that respect the intelligence and maturity of their actors and audience. Performers are guided towards creating their own unique characters and costumes, while stage crew members are trained to handle all backstage operations for each show, including lighting and sound. The Highland Community Players are truly a unique institution. Our work has been featured in The Milwaukee Journal-Sentinel, Milwaukee Magazine, The Milwaukee Record, OnMilwaukee, Teaching Today, and many other media. Our 2016 production The Bully, The Liar & The Thief garnered a certification of commendation from the State of Wisconsin and a gift of appreciation from Jack White’s Third Man Records. The Upper Elementary Play (Grades 4-6) is an original world-premiere that goes far beyond the limits of typical children’s drama. We look to actively engage our audiences in each performance and explore themes that are relevant to our students and their families. Our spring 2017 production, Quest for the Sacred Orb, was called “some of the most daring, one-of-a-kind and thrilling theater in the city” by OnMilwaukee. Check out the review here. The Adolescent Play (Grades 7-8) finishes off HCP’s season with an established “classic” play intended for older students and their families. Where as the circus and upper elementary play are all-school events in the Highland gymnasium, the annual adolescent play is performed in our experimental “black box” theater for a truly intimate (but no less wild) experience. For more information on our latest work, check out our Facebook page! At Highland, we believe in our students— in their ideas, their energy and their capacity to change the world. So we invest in their leadership. Each year, our 6th graders participate in the Montessori Model United Nations Conference (MMUN), a global conference where students act as ambassadors from countries across the world. In preparation, they spend months researching policy, geography, history and current events. They grapple with difficult issues and develop their researching, writing, debating and presentation skills. After months of hard work, students travel to New York City to act as delegates at the United Nations Assembly Hall. They spend long hours developing resolutions with their peers and each student delivers a speech in the hall. This experience of negotiating and cooperating with peers from all over the world gives them a perspective on leadership that is impossible to match in the classroom. Through this process, a deep passion for serving others is stoked. Highlanders develop interesting plans for everything from getting medicine to areas in need to increasing renewable energy. Without this program, these students may have never had the opportunity to explore these ideas from a leadership perspective. Highland is committed to making certain all of these students have the opportunity to share their ideas and learn new ones from their peers from around the world.